Many people have requested the pattern for how to make my Sparkle & Shine Mini Album. I am not allowed to sell the template/pattern, but there are two ways that you can get it! Buy any one of these items, and I will send you the instructions via e-mail as soon as I am notified of your order. To order, you can simply click on the item name. I share all of my classes and templates with my team so that they can use it personally or for their classes. They often get to see things long before I show them on my blog or Facebook page! Actually, there's a whole bunch of sharing on the Rose Blossom team from each one of the team members. We have all kinds of photos and files on our Facebook group for every level of inspiration. I love that everyone is so willing to share ideas! The Consultant Kit is $49, and there is just so much in that kit. It's approximately $155 of product, so the products shown are at an almost 70% discount! 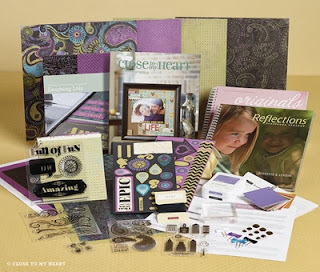 Besides the Consultant Kit, wouldn't you love to get a generous discount on your own personal paper crafting needs? The quarterly minimums are low, and the fellowship is not only great on the Rose Blossoms team, but throughout all of Close To My Heart. I cherish the friendships I have made across the miles thanks to Close To My Heart! I would love to answer any questions you might have - whether it is to make a purchase or join my team. I love hearing from you! Thanks for stopping in and have a creative day! So true! Your ideas are always so helpful for the team and we love to share! Brenda I would love to get the pattern for the tri shutter album. When I place my order do I join one of your gatherings listed or just place the order? I can't wait to get started! I just placed my order! I can't wait to get started when I get the directions. Thanks Brenda. I placed my order on line, so can you please email me the mini album instructions at andrea_gallas@merck.com? Thanks!